So, you're looking for shelving for your new home office design? Shelving is probably one of the most important elements of a home office: it's as space-efficient as can be, using little floor space, but really packs a punch when it comes to storage. Designing a home office can be difficult, but thanks to our buying guides, there's no need to worry about finding what you need. You've picked a pretty good time to purchase, as Black Friday and Christmas are approaching, which equals furniture deals all round. This contemporary home office shelving unit from John Lewis & Partners is both stylish and functional. The designers have chosen to use both oak and oak veneer to give it a sturdy, hardwearing structure, perfect for storing files, books and other necessary office items. The boxes at the end of each shelf can be used to frame a lamp or ornaments, so you can extend your unique taste to your home office. If you’re a fan of shabby chic, this shelving unit from Marks and Spencer combines iron and wood to create a smart industrial–feel shelving unit that would look great as a statement piece for your office. Featuring five shelves, there’s plenty of room for you to create an organisation system. Whether it’s baskets of spare stationery on the bottom shelf, books on another and files on top, you won’t be stripped for space. Of course, home office shelves can be decorative too. This pair of industrial shelves combine a black iron frame with a shelf surface to create units that are minimal yet stylish. They therefore lend themselves to displaying rather than storing, so any picture frames or business awards would look great taking pride of place on either of these shelving units. Bear in mind that fixtures and fittings aren’t included with these units and will come at a separate cost. If you’re looking for a substantial shelving unit that contributes to the interior design of your home office, this rustic unit from John Lewis could be just the thing. Whether you’re after plenty of room to store files and books or display decorative items, the varying depths of the six shelves gives you plenty of ways in which to use the unit. Because the shelves are angled like a ladder, this unit will take up more room than your standard set of wall shelves, so it may be best suited to large home office spaces. 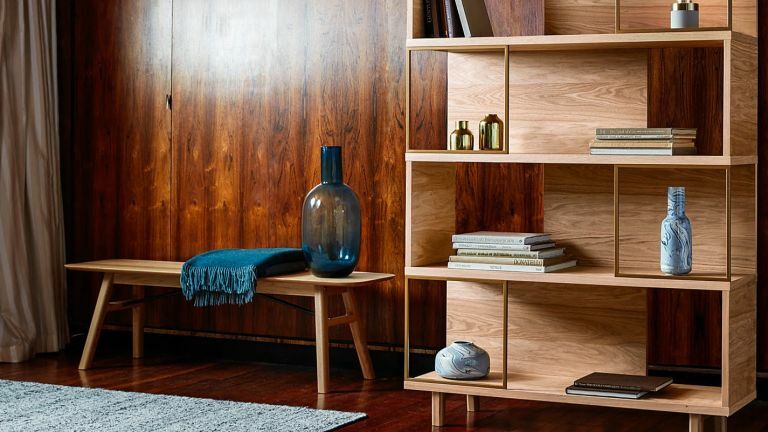 This shelving unit comes in variety of effects, including white, oak, walnut and grey, so there’s plenty of choice if you’re stuck trying to find one that fits in a traditional home office. There are four shelves, perfect for storing a combination of books, files and photos. There’s the added bonus of two drawers at the bottom of the unit, which are great for storing clutter you’d rather keep hidden. Plus, the unit comes fully assembled, so you won’t even have to take time out of your busy schedule to put it together. If you like the look of our pick from Marks and Spencer but you are working with a small home office, you may be interested in this pick from Not On The High Street. Combining steel and reclaimed wood, it’s industrial in style, even in the way in which the brackets fix the unit to the wall. There are three shelves which are fairly short in length, so it’s a great choice if you’re only looking to store stationery or trinkets. This versatile unit can be used in multiple different ways depending on your needs. Each individual cube is perfect for those who love creating organisation systems, but you could also mix and match with drawers to create places where you can store items that you’d rather keep tucked away. You may even use some cubes for filing and some for displaying ornaments. The unit is available to purchase in white gloss, white matt, beech, or oak, so it should offer a colour suited to your taste and existing decor. Sometimes all you need is a storage unit that can tick all the boxes. This one from La Redoute offers three shelves to store necessary or decorative items (you can move the shelves to different heights to suit), and two cupboards (which merge into one compartment) to store important documents safely away. So that's practicalities out of the way – what about looks? As you can see, it's a shapely take on Mid-century modern style, which makes it ideal for both contemporary and traditional-style homes.